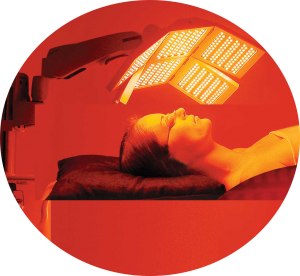 Why Lightwave: LIGHTWAVEs patented Red, Infrared & Blue Light therapy can dramatically revitalize your skin without any downtime or discomfort. Our innovative aesthetic treatments help counteract years of sun damage, environmental damage, aging, acne and acne scarring. LIGHTWAVE provides noticeable results, often in a couple of treatments, without the high cost and downtime of other more expensive treatment options. What to Expect: LIGHTWAVE are safe, simple and easy. The amount of time you spend at your skin care specialist may vary based on your individual skin care needs. You can expect an individual LIGHTWAVE treatment to take up 30 minutes and allow for an additional 20 minutes for pre and post care. Its so simple and fast that many patients have treatments during a lunch break or on a quick stop on the way to or from work. However, the relaxing, euphoric effect usually last throughout the day. After the Treatment: Each individual responds differently; some notice changes much more quickly than others. The following principles are generalities; specific results will vary from client to client based on the client needs and lifestyle. The following protocols have been designed to address the most common requested treatments. Our treatments range between 8-30 minutes in duration. For more information on any of the above treatment contact your local skin care provider. If you need help finding a local provider you may visit our practitioner locator tool. You can also visit our patient photos page for more information.